When I started this painting I fully intended to do a portrait of Freyr in his aspect as Lord of Alfheim (King of the Elves), but as I set out on that path I found the road took me to a darker place. I found a Horned God without a clear name. 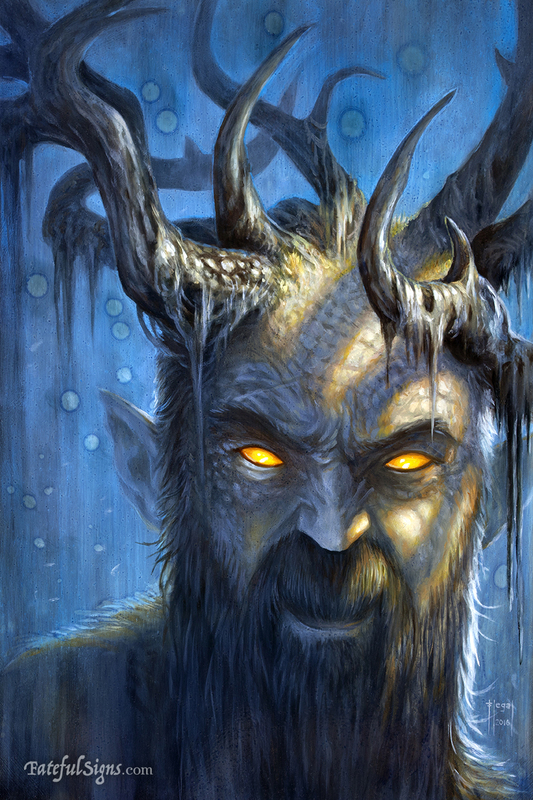 Perhaps I stumbled across Cernunnos, The Horned One of Celtic Lore, or Herne the Hunter from English Folklore. I wasn't sure, only that this was the painting I wanted to paint. Now many scholar's theorize that Freyr was also a Horned God. His connection to the stag is clear. As I thought more on Alfheim I considered that elves or in the older way Alfs are male ancestral spirits. Female ancestral spirits are Disir. So a realm made up of the ancestral dead might be a dark place indeed, and it's King might reflect that. At the time I worked on this painting I was reading, "The Cult of Kingship in Angle-Saxon England" by William A Chaney. One line that really stood out to me was that for the leader of a group "...the horns and hide of a stag were donned for heathen festivities at the New Year" (Pg 131). Horns for the Lord, Freyr means Lord. The final component was discovering images of various horned animals shedding their horns. I found it fascinating the way the new horns grew right out of the old antlers. This got me thinking about modern Paganism. That out of the Old Way a New Way grows. I can't answer for sure which God is in this painting, that's for you to decide; but he's horned, he's King, and his crown grows strong again! The original fantasy painting was done in oil and measures 12" x 18".